Across Africa, black and white rhinos are fighting for survival. Botswana could be their last haven and final hope. Rhino Conservation Botswana (RCB) is working with the Botswana government to keep these precious animals safe from extinction. And you can help! Rhinos were once abundant throughout Africa and Asia, but since 2008 poaching has increased dramatically, pushing them close to extinction. Poaching is driven by demand for rhino horn in East Asia, where it is used in traditional medicine. As a result, horn is one of the most valuable natural commodities on Earth today, and is worth more than its weight gold. Yet scientific studies have proved that rhino horn is made of keratin – just like our fingernails – and has no medical properties. Africa’s rhinos are in at a tipping point. More are brutally killed than are being born, and if things continue unabated, these beautiful creatures could go extinct by 2024. 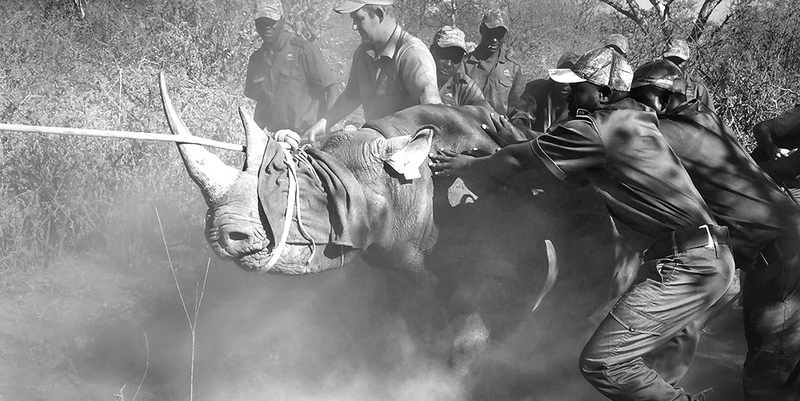 · Support and protect a growing population of black and white rhinos in the Okavango Delta. · Protect and restore the rich biodiversity of the Okavango Delta. · Build perception of rhinos of one of Botswana’s “national treasures” and engage local communities in their conservation. · Disseminate knowledge and best practice in rhino management and monitoring across Africa. To do this, we need your support. Botswana is proud to be home to a stable and increasing population of rhinos. As numbers rise, and more rhinos are moved to the safety of Botswana from other southern African countries, we need to increase our monitoring and protection capacity to keep them safe. We need to put more teams of rhino monitoring officers in the field. These teams require salaries, food, training, vehicles, a sophisticated communications system with GPS, binoculars, cameras, first aid kits and snake-proof boots. To monitor the rhinos closely, they also require tracking devices and darting equipment. To maintain constant surveillance over the vast expanse of the Okavango Delta, our teams require all-terrain vehicles, boats and light aircraft. The region is tough on transport, with constant attrition from water and sand, so all modes of transport require regular maintenance as well as fuel. This year, a number of rhinos will be translocated to Botswana. On arrival, the rhinos will be kept in secure bomas – fenced enclosures – where they will be habituated to local smells, sounds and food before being released into the wild. This summer, we need to build sturdy, wooden bomas for our new arrivals. These permanent constructions will also be used to house any injured rhinos requiring medical care, and any rhinos that wander off into less safe areas and need to be recovered. Looking after rhinos in the bomas is a full-time job, as they need water, food, medical attention, cleaning and daily assessment. We need to hire staff to care for and monitor the rhinos, and build a field base nearby to house them. Rhino monitoring patrols will also use this permanent camp as a base from which to keep the new arrivals safe. Sometimes young male rhinos wander out of the core protection zone and into more dangerous areas, so we need to dart them and bring them back to safety. For this, we need to have a specialized vehicle on call – a seven-tonne 4x4 truck with a five-tonne crane – as well as several rhino crates, so that we can bring our walkabout rhinos home safely and securely. £28 - Will pay for 50kg of high protein browse pellets for feeding rhinos in bomas. £70 - Will pay for five days’ field rations for our dedicated rhino monitoring officers. £245 - Will pay for emergency veterinary costs to dart and treat an injured rhino. £560- Will pay for a satellite phone to enable field teams to stay in touch during operations. £1000 - Will pay for helicopter costs during a rhino darting operation. £2,800 - Will pay for a rhino to be fitted with a tracking device so it can be monitored and protected. £4,000 Will enable officers to have sufficient tracking equipment. £35,000 will enable the building of a Boma to protect the new Rhino’s to the Okvango Delta. .
£40,000 will give RCB a new vehicle for the team of monitoring officers. £350,000 will fund the cost of one light aircraft to track and monitor the Rhino’s. Sign up for our newsletter to receive updates on our projects and upcoming events, and to help support wildlife conservation and research projects across the globe.